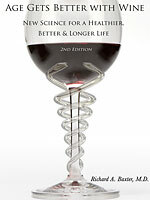 The second Edition of the New Science for a Healthier, Better and Longer life by Dr. Richard Baxter concludes that drinking regular wine in moderation is anti-aging. It is based on scientific analyses of studies done so far and is a highly recommended book for doctors and non- doctors alike, recommends Subhash Arora. The book is about the science of anti-aging and is based on scientific studies done by others and goes even beyond the heart health and wine relationship. According to the author, wine isn’t a nutritional supplement, but nutrition for the body and mind. Of course, the author warns that just like too much of good vitamins which are supplements, are harmful for the body, the same holds for wine as well. He is critical of the medical establishment for being overly protective against wine for commercial reasons, even though not drinking has been established the number two risk factor in the US for cardiovascular disease, after smoking. The author starts from the historical evidence available for producing wine since 5000 BC-starting from Iran. The Bible mentions its name apparently 650 times, underscoring its importance during biblical times. He even records a sixth century BC Indian medical text that endorses the medical benefits of wine and their pantheon included a goddess for wine, Sura. The journey through various personalities in Greece, Egypt, and China etc. singing praise of the medical benefits of wine is fascinating. He blames the American woman Carrie A Nation for spearheading a campaign in the early twentieth century against all types of alcohol as the root cause for creating ill will towards wine and eventually bringing prohibition in the US. Since then, the polarization of views has taken place for and against alcohol including wine. The book centers on the benefits of Resveratrol as the key ingredient, putting wine ahead of alcohol or many other dietary intakes. Dr.Baxter has gone into several studies including the Mediterranean diet, the famous Framingham study, Klatsky’s findings, and the J-shaped curves linking the number of daily drinks with the effect on the heart etc. and concludes that wine is the most healthful of beverages and that age gets better with wine. He goes on to explain in rather technical jargon about the molecular biology of Resveratrol, the chemical found in red wines and all the polyphenols which include the king Resveratrol; no wonder it was cited in 350 papers in 2006 in the PubMed publication as compared to practically nil in 1990. Polyphenols are redefining the nutritional science. As many nutritionists will tell you, they are also available in many natural products like fruits, vegetables, tea etc. and he devotes almost a complete chapter on the available natural resources but wine comes out trumps. The only jarring note in the wine and health equation is the effect of wine on cancer where a growing body of data is at odds with many of the preconceptions about wine and cancer. But the author is convinced from the studies that the specific wine-derived polyphenols and not necessarily only resveratrol, block the progress of cancer at every turn- in fact this blocking has even been termed chemoprevention. He lists several studies that point out the J Curve relationship for cancer as for the heart. He also talks about the rising tide of the studies and meta-analysis indicating moderate alcohol consumption increased breast cancer risk by 10% a drink a day. But he notes that all studies did not find a direct correlationship. He also notes many problems with the data. In fact, his conclusion is that one may never get the real answer about the risks of low-to-moderate wine drinking and breast cancer for the simple reason that suitable study populations don’t exist anymore because of the existing lifestyle. Based on all the studies he concedes however, that there is increased chance of developing breast cancer in the 10-30% range in post menstrual women which measures against the decreased odds of heart attack and stroke in the range of 30-40%. Potential benefits in terms of diabetes, osteoporosis, gallstones and Alzheimer’s disease and general health show a net gain. The negative effects seem to be taken care of by taking a healthy diet and adequate B vitamins. The Greek philosopher Plato wrote of moderate quantities of wine being a medicine for sound health and strength of the body 2500 years ago. A Latin tome advises one ‘to drink wine during a meal happily, little but often.' The Book of Wine printed in 1478 noted that wine fortifies the brain and natural strength and causes foods to be digested and produces good blood. The earliest book in modern times that came out in 1951, called Seven Countries studied the dietary trends in Crete residents who enjoyed longer life expectancy despite poor access to health care services and who had wine as a part of their daily life style, which later came to be defined as the Mediterranean diet. Eventually, the US Department of Agriculture declared in 1993 that a glass of red wine a day was part of the recommended food pyramid. Wine buying and consumption with food has become a choice of people who live a healthy lifestyle, as the book enunciates with ample examples. The author does stress though that the lower priced wines may not have the requisite polyphenols, although its amount in wine depends on the winemaking process. The book touches on the comparison of wine with vitamins in various chapters and also the exploding market of resveratrol pills. However, the jury still seems to be out on the true benefits of resveratrol in the non-natural, pill form and we can expect updates on resveratrol and the longevity effect. Despite the fact that the book gets too technical at points, perhaps to explain from the medical or chemistry perspective, it is a serious book that looks at the subject with an impassionate look. Dr. Baxter seems to be slightly biased towards wine in the handling of cancer relationship. But with a media report yesterday that cited a study in Australia concluding that viewing TV for more than 5 hours a day increases the chance of early death by 46% (or some such vague finding), it does vindicate his stand that a small increase in the risk for breast cancer may be justifiably balanced with the net gains. While many of the studies are done by researchers who depend upon grants to support their work, Dr. Baxter has had no such constraints-he is a practicing plastic surgeon who believes he is able to provide anti-aging on the outside of the body to his clients cosmetically, whereas wine helps preserve the body longer. The book is a fascinating read with all the well-known reported studies highlighted and the conclusion that wine in moderation can be anti-aging is re-assuring due to the scientific analysis. The book is highly recommended for doctors who want to dispense medical advice on wine drinking and health. It should be prescribed as a general read for medical students and of course, any wine lover who likes to reinforce his love for wine. It is available on Amazon.com for $15 or directly from wineappreciation.com. A study in Copenhagen based on several earlier studies concluded that there was a 30-point increase in the IQ of wine drinkers over those who drank primarily beer or spirits. It is difficult to tell from the studies if wine makes one smart, but that smart people drink wine. There is evidence that wine polyphenols activate enzymes involved in learning and memory centers of the brain. So it seems like a re-inforcing process.